How Much Does It Cost To Rent A Dumpster in Grand Rapids MI? 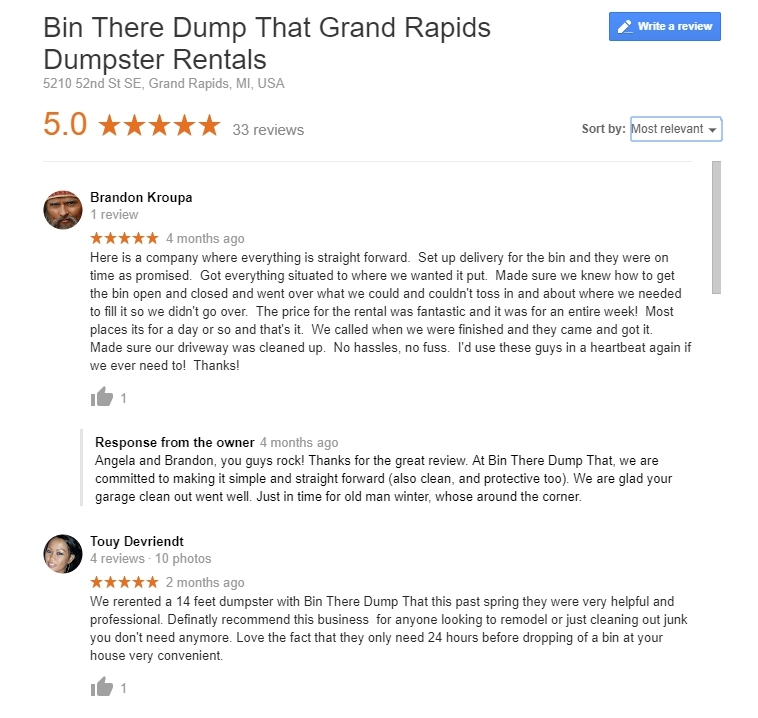 At Bin There Dump That, we understanding renting a dumpster in Grand Rapids should be easy and affordable. This is why, our expert staff is knowledgeable and talks to homeowners and contractors to discover what dumpster size they'll need and provide them the most value. We understand that renting a dumpster might not be something you have previously done. Bin There Dump That Grand Rapids offers affordable dumpster rentals with service you can count on. In Grand Rapids, dumpster rental fees can vary based on the container supplier you work with. Here are some of the typical price ranges that we see along with other fees that are sometimes charged by different companies. *You should always ask about your final price before you provide a credit card to rent a dumpster. At Bin There Dump That we offer affordable, competitive dumpster rental prices. All of our rental prices include an allotted amount of tonnage and you can keep the bin for 7 days. Let us help you take the guesswork out of your project. Call our Dumpster Consultants, they are knowledgeable and talk to homeowners and contractors every day. Bin There Dump That offers affordable pricing with service you can count on. We understand that renting a dumpster might not be something you have done before or for contractors, it is a small part of a bigger project that you don't want to worry about! Ready to connect with our Dumpster Consultants to rent a dumpster? We eagerly anticipate your call or email.